Pre-register below or just show up! 12:30pm at Esquimalt Gorge Park off Tillicum Road and across from the Gorge Pointe Pub (the larger Gorge Park also known as Kinsmen Gorge Park). Meet at the main parking lot. 12:30pm @ Downtown at the Parliament Buildings Meet by the fountain at the legislature buildings. Street parking is free on Sundays! 12:30pm @ Hyacinth Park Meet at the parking lot along Marigold rd. 12:30pm @Centennial Park Meet at the parking lot by the lacrosse court, turn left into the parking lot at the end of Hovey Rd. Come and walk your dog with a large group. The objective is to learn how to walk around other people and dogs in a calm manner. Walking with a pack is a natural and non-confrontational way for your dog of any age to learn to be social but still have self-control. It's all on leash and is a mix of socialization and training, and with a group of people that are all working on their own dog’s skills. Vaccinations — Must be vaccinated to attend as this is an outdoor walk. During this one hour walk, you will participate with your dog while being guided by a qualified trainer! 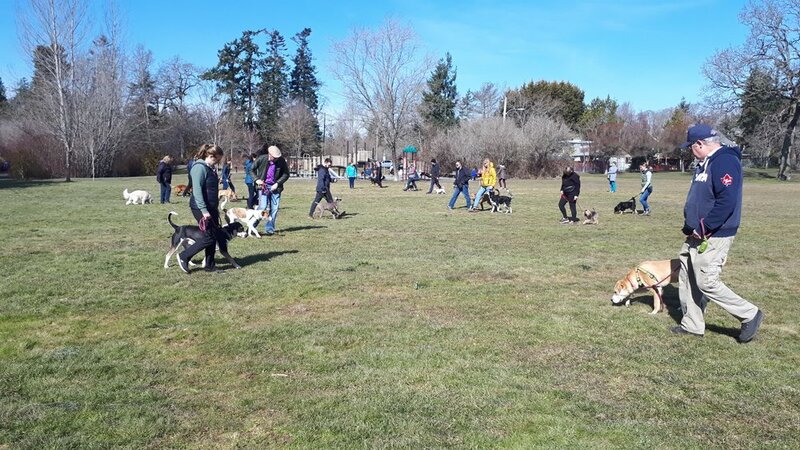 We walk as a big pack of people and dogs, we get some exercise, we help our dogs learn to walk calmly around other dogs and we have fun with obedience training games while we go! Every Sunday the location changes so we continue to explore great locations together. Anyone who wants to get out and join a welcoming group of people that are all working with their dogs to be the best they can be. Not sure if your dog or puppy is a good fit? Get in touch and we can decide together. No age limit - all dogs welcome. Please note that we have a lot of young puppies attending these walks so your dog must be reliably safe or muzzled if there is any risk of reactivity or aggression. Please bring weather appropriate clothing, water for you and your dog, cell phone, leash (no flexi leashes please) and collar (with ID tags). And don’t forget some poop bags. Safety: Please keep dogs at least 5-10 feet apart when you first arrive as temperaments and excitement levels cannot be guaranteed. Please refrain from pulling out toys or treats when close to any other dog as to avoid any resource guarding aggression.